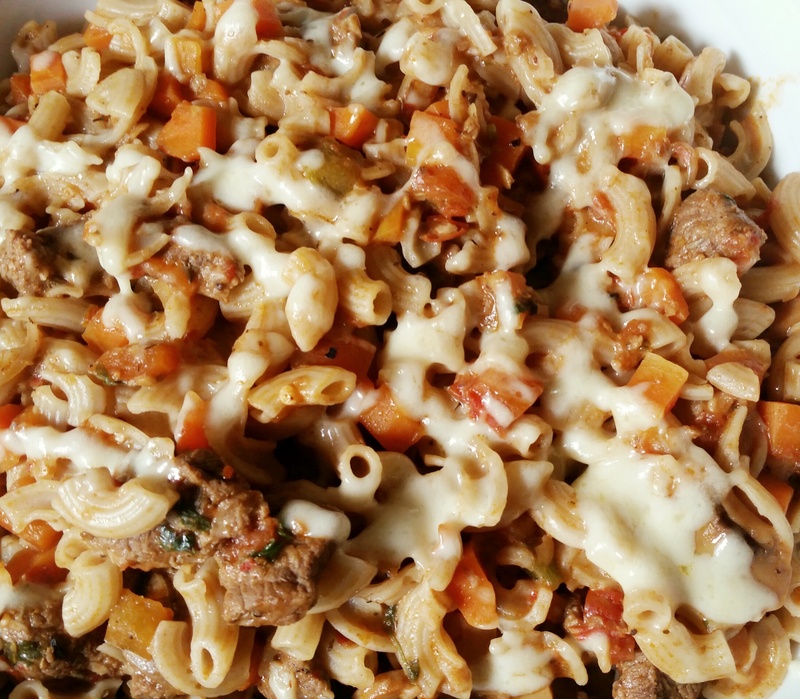 When you’re short on time, but need to make a delicious meal family style- a meaty pasta dish is the way to go! Pasta is one the most versatile carbs you can utilize: just add in the meat or seafood of your choice, veggies, either a cheese/ tomato/ pesto based sauce and go! Like I’ve mentioned before Pinterest is my go-to for a quick cooking fix. 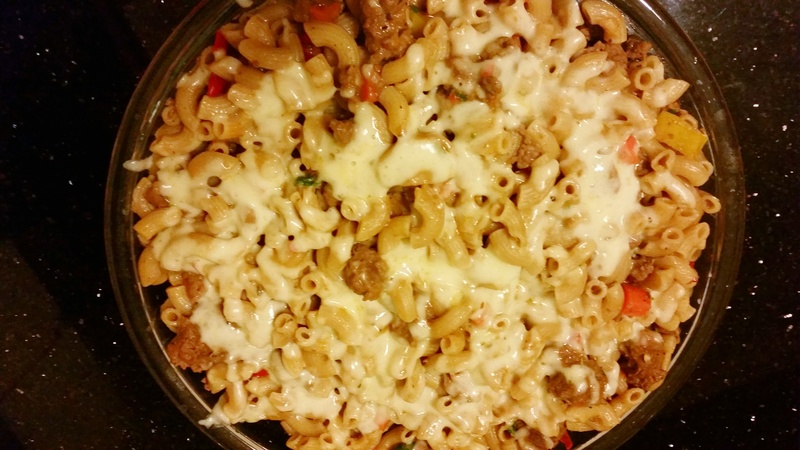 And this recipe, like many others, is modified from The Cooking Jar‘s Slow Cooker Beef and Cheese Pasta. Thanks Farah! I was bored, so while browsing through Pinterest I discovered this recipe, and since I don’t own a slow cooker, I would need to modify it to how I’d like it. 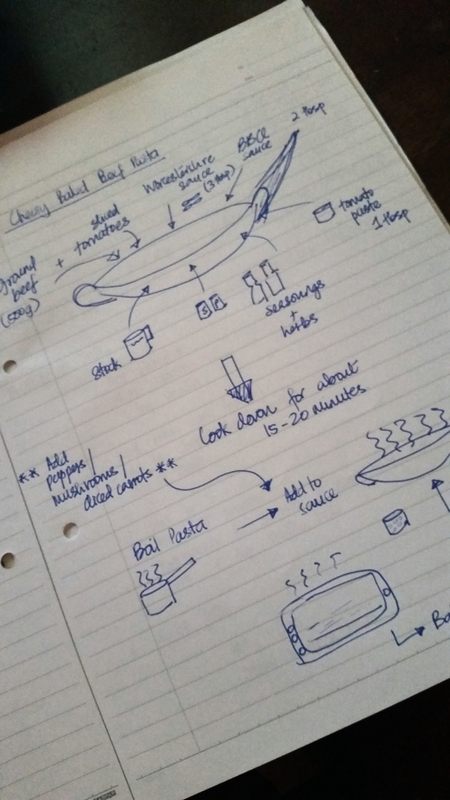 So I actually mapped out a little recipe flow chart for fun! As a result of my boredom, procrastination came calling and I got busy catching up on all my TV shows…. Nothing like some Raymod Reddington and Elizabeth Keen action in The Blacklist. Now I needed to make dinner fast! And everyone was hungry! Time to get cookin’. I didn’t have any ground beef at hand, so I used some chopped beef, and substituted the beef stock cubes for regular vegetable stock. This is one of those recipes that have a large list of ingredients, but the cooking method is quite simple and the results are amazing! I don’t usually use canned tomatoes, so I substitute with freshly chopped tomatoes, tomato paste and stock/ water. If you have the canned tomatoes on hand, go ahead and use about 2 cans as in the original recipe. Boil the pasta, al dente, according to the instructions on the package. In a separate pan, add about 2 tablespoons of olive oil, and saute the onions and garlic until golden brown, Add in the beef and cook until well browned. Then add in the carrots, tomatoes, sauces and tomato paste and allow the flavours to mix well, and until the carrots are tender, for about 5 minutes. Next, add in the stock, seasonings, chilli flakes, mushroom and peppers and cook well. Allow the sauce to simmer until it becomes thicker. Mix in the cream cheese, on a low flame. The sauce should be meaty and creamy at this stage. Toss in the cooked pasta and mix the sauce with the pasta well. Add it into a baking dish, grate over the Mozzarella and bake in a pre-heated oven at 180 C for about 10-15 minutes, until the cheese has melted. So much cheesy goodness! One of the best pasta recipes I’ve ever made and it’s definitely a keeper! There was more than enough for the next day for lunch as well! Yummmss! Yup! Making something like this tonight at my pasta restaurant! Looks great! Thank you! And that’s great to hear!